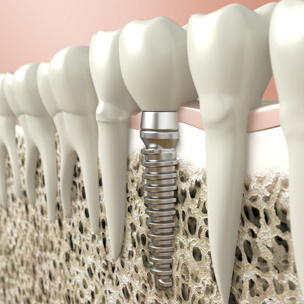 Millions of people have turned to dental implants to help complete their smile. As the only permanent solution to tooth loss, dental implants have quickly gained favor as the preferred method for tooth replacement. In fact, implants match the appearance, function and strength of natural teeth so well that you may forget that you ever lost a tooth. For the vast majority of patients, dental implants are a quick, easy, and relatively pain-free way to replace broken or missing teeth. A dental implant is a titanium screw that is surgically placed into the upper or lower jawbone as an anchor for a natural looking crown. Dental implants can be used to replace teeth lost due to accident, disease or congenital abnormality. Dental implants are strong, stable and durable. In fact, with proper maintenance they can last a lifetime. Dental implants are strong and secure so you can speak and eat with confidence, without having the fear that it could fall out, like with dentures. In addition to restoring your natural chewing and speech, they can resolve the joint pain or bite problems caused when teeth begin to shift following tooth loss. Dental implants have the added benefit of being strong enough to support other dental appliances, making bridgework or dentures more secure and comfortable. Plus, they look so real that they are virtually indistinguishable from natural teeth. Implant placement generally requires several office visits. The dentists at Warshauer & Santamaria we will carefully explain each step of your treatment to you and will provide you with after-care instructions to ensure that your teeth and gums remain healthy. Following placement, periodic follow-up visits will be scheduled to monitor your implants, teeth and gums. Proper oral hygiene, good eating habits and regular dental visits will help maintain the life of your new implants.